Little Beach - One of Tasmania's East Coasts hidden gems is the perfect place for a picninc in the grassy dunes or a refreshing swim on a warm day. 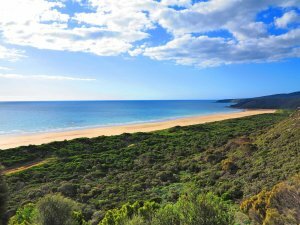 Little Beach made the list of Australia’s 101 Best Beaches in 2017. Small town with big beaches on the northeast coast. Follow the bubbling Scamander River to the ocean and you’ll find the beautiful little coastal town of the same name. Situated between the fishing port of St. Helens and St. Marys, Scamander draws tourists from around the world for its wide, white sand beaches and breathtaking views of the ocean. Scamander somehow still feels like a traditional Tassie holiday shack village despite the abundance of accommodation and amenities. If you want to feel a real outdoor Tassie escape without sacrificing the comforts of modern life, then this riverside town is for you. Scamander is where you escape the hustle and bustle of the every day. Scamander can be deceiving when looking at a map. It appears to be right next to Launceston, but there are no direct roads. 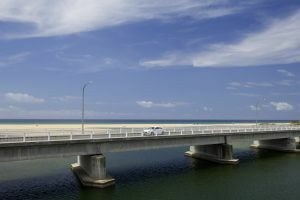 You’ll have to drive 2 hours, about 180 kilometres, from Tassie’s largest inland city. Scamander Beach offers up all sorts of outdoor fun. Take a dip in the crystal clear waters or you can choose to surf the Tasman Sea’s breaks. And at Scamander Beach, you’ll find the mouth of the Scamander River which is full of Sea Bream waiting to bite at your bait. 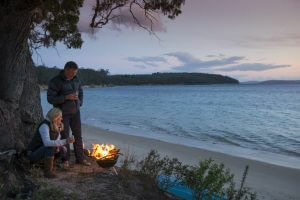 Anglers enjoy camping at the Scamander Forest Reserve just inland from the beach. Fisherman catch, clean and cook the fish right on the banks of the river at the camping facility’s many barbecue pits. It’s the perfect place to meet like-minded outdoor enthusiasts. Nearby Henderson Lagoon boasts clear waters and over 7 kilometres of well-marked walking tracks. Bird lovers flock to the lagoon to spot more than 80 different species of marshland and woodland birds. Scamander isn’t only for the nature lover. The river is lined with retreats that will suit even the most worn out leisure seeker. There’s nothing more relaxing than sitting at the mouth of the river listening to the ocean’s waves break in the distance. The stretch of coast between Scamander and Bicheno is known as the Surf Coast. If Scamander Beach is too populated with boards, just head down the coast to find another spot. This stretch of coast has reliable surf, wide breaks and long beaches with soft sand perfect for the adventurous. Scamander has the perfect mix of fresh and salt water fishing. Anglers can choose to fish for bream in the river or cast into the ocean. And if you want to charter a deep sea fishing boat, you’re only 15 kilometres away from St. Helens where adventure guides are happy to accommodate. You’ll have to drive. If you’re flying into Hobart and hiring a car, it’s a 3-hour drive over land. But you should want to take an extra 30 minutes to drive along the coast. It’s the same 3 hours from Devonport, and it’s a roundabout 2 hours from Launceston. You’re not going to find any five-star resorts gobbling up the beach in Scamander. Instead, you’ll find plenty of motels, bed and breakfasts and some self-contained accommodations. There are wonderful riverside retreats for those seeking relaxation or some bream, and, of course, there is plenty of camping along the river. Many of the accommodations have wonderful ocean views. After all, there are no towering, populated resorts to sully the small town, Tassie feel of Scamander. Summertime swimming is quite popular in Scamander, as is summertime lounging on the white sand beaches. After all, there’s only a short window of time to claim that tan. Camping, fishing for bream and cooking the fish on an open barbecue creates a sense of community in the reserve’s campground. And there’s is plenty of bird watching to do at the Henderson Lagoon where more than 80 species of bird make their homes. The river was originally named Borthwick by the first European to explore the area. In 1825, John Helder Wedge landed in town to name the area Yarmouth after a city in Britain. The town and river would later be renamed Scamander. The river has been a challenge throughout the history of Scamander. The first bridge was built by Richard Terry in 1865. The timber bridge had supports that were no larger than a modern telephone pole, and a large herd of cattle collapsed the bridge under their weight shortly after the bridge’s construction. A bushfire claimed 18 houses and a restaurant in 2006. Scamander holds the record for highest temperature ever recorded in the state of Tasmania at 42.2 C (108 F) in 2009. Even if you don’t fish, many local outfitters will be happy to take you fishing for bream on the Scamander River. It’s worth the experience. Take a morning to walk the Henderson Lagoon even if you don’t fancy birdwatching. The nine-hole Scamander golf course is perfect for a relaxing half-day with friends and family. Nine holes goes quickly so it’s perfect for everyone. Other Things To Do. What’s Nearby? Nearby Douglas-Apsley National Park is a perfect day trip. It has a variety of short walks that can take you to breathtaking lookouts like Apsley Waterhole and the Apsley-Myrtle Rainforest. Head down to Fingal Valley for a variety of shops, restaurants and boutiques. Spend an hour at the Cranks and Tinkerers Museum before heading onto the main thoroughfare for incredible pancakes.